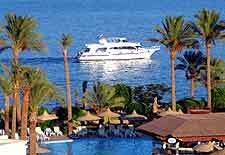 Sharm el Sheikh is a particularly stunning coastal resort and lies along the southerly coastline of the Gulf of Aqaba. Located close to both the Ras Mohammed National Park and also Tiran Island, Sharm el Sheikh is part of a thriving tourist industry in this part of Egypt. Surrounded by beautiful sandy beaches, turquoise waters and glorious coral reefs, each year huge numbers of tourists head to Sharm el Sheikh to scuba dive and marvel at the underwater life which is so concentrated in this spot. The Sharm el Sheikh area offers two main bays, which are adjacent to the very centre of the resort. Na'ama Bay comprises a number of developed tourist resorts and is really the heart of the action, with a prominent shopping centre and great places to eat out. The nearby bay of Sharm al-Maya lies to the west of Na'ama Bay and is centred around the bustling Sharm Old Market, a walled location where you will find bags of characters and plenty of cheap eats. A top tourist destination, attractions in Sharm el Sheikh are diverse to say the least, although there is plenty for each member of the family. Tourist planning Sharm el Sheikh holidays will likely be coming here for the sun, sea and sand, as well as the nightlife. Popular attractions include the city's many beaches and scuba diving opportunities - with crystal-clear warm water, outstanding underwater scenery and many brightly coloured fish; Na'ama Bay - a particularly appealing spot for tourists, with breathtaking coastal scenery, water sports and extreme natural beauty; Mount Sinai - a scenic group of peaks close to Sharm el Sheikh, with religious significance and many winding pathways; the famous Burning Bush - with biblical origins, renowned for being the site when God first spoke to Moses; and also Ras Muhammad Natural Park - located on the southerly tip of the nearby Sinai Peninsula and known for its exceptional coral reefs. 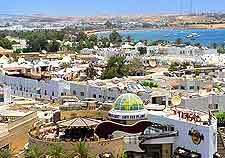 More information about Sharm el Sheikh Tourist Attractions. Around the city of Sharm el Sheikh, a number of important historic landmarks stand out and are not to be overlooked. Of interest to visiting tourists, the Chapel of the Burning Bush is an attractive building and dates back to the 6th century, while St. Catherine's Monastery is well-known in the Sharm el Sheikh area and one of the world's most historical Christian monasteries. Also worth searching out is the Seven Elders of Israel Amphitheatre, an important religious monument located on Mount Sinai and easy to spot. 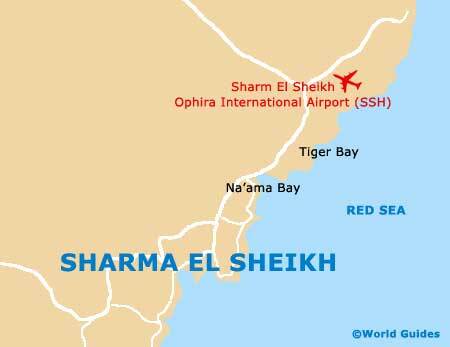 More information about Sharm el Sheikh Landmarks. Sharm el Sheikh is certainly not known for its museums and local art galleries, with little to offer tourists expecting these cultural attractions. Located along the Mediterranean coast, the Sinai Heritage Museum stands out and offers an in-depth information about the Bedouin culture, with many important artefacts and handicrafts. More information about Sharm el Sheikh Museums. Outside of Sharm el Sheikh and within easy reach of the resort lies a diverse mixture of tourist attractions. Amongst the most popular, the lively coastal resort of Hurghada is also known for its exceptional scuba diving and marine life, while the coastline and waters around Dahab, north of Sharm el Sheikh, also boast more than their fair share of water sports and underwater scenery. For hiking trails and excellent snorkelling, a visit to the north-eastern resort of Nabq is in order, where the mangrove forests are of particular interest. More information about Sharm el Sheikh Attractions Nearby.